The words Kuthira Malika means ‘mansion of horses’ and the uninitiated may think that the palace is a grand stable built to house horses. In reality, the building gets the name from the row of horses that are sculpted into the brackets that support the roof. The palace, also known as Puthen Malika Palace, is adjacent to the Sree Padmanabhaswamy Temple in Thiruvananthapuram. It was built by Swathi Thirunal Balarama Varma, the ruler of the former Kingdom of Travancore who was a social reformer and poet and musician. 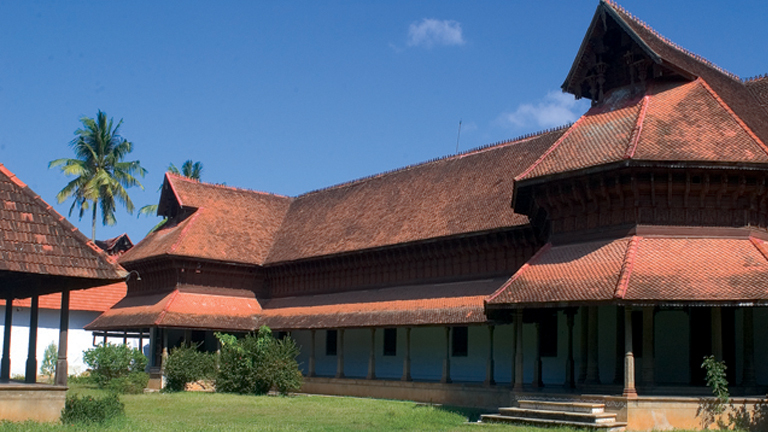 It was built in the traditional Kerala style in the 1840s, with pillared verandahs and overhanging eaves. One part of the palace is a museum that houses many valuable objects and relics owned by the royal family. The celebrated Navarathri Mandapam, which is the venue of famous music concerts, is located just in front of Kuthira Malika Palace. The mandapam has got unique sound reflectors in the form of hanging earthen pots. This sound arrangement has won acclaim because of the excellent acoustic effect it produces.